The authors report their knowledge about an uncommon case of isolated vasculitis, restricted to the left sylvian artery during an auto-immune Guillain-Barrè syndrome (GBS), sustained by cytomegalovirus (CMV). An acute cardiopulmonary failure requiring a ventilator and vasopressor support manifested, notwithstanding plasma exchanging and immune-modulating therapy. An IgM-enriched formula administration coincided with a rapid amelioration of GBS and vasculitis to a complete recovery the next month after her discharge to a rehabilitation centre. Isolated vasculitis of the central nervous system (CNS) is an uncommon clinicopathological entity, which is characterized by vasculitis and is restricted to the vessels of the CNS, without any other apparent systemic lesion . Arterioles are the most common target of degenerative processes, with mononuclear cell infiltrates as a distinctive sign, but vessels of any size may be involved. Viruses, such as cytomegalovirus and varicella-zoster virus, bacteria with strong neuronal tropism, such as Treponema pallidum (the agent that is responsible for syphilis), and Hodgkin's disease have been identified as aetiological agents. Herein we report a case of sylvian artery involvement in a young patient affected by an episode of GBS , after coinfection with cytomegalovirus and herpes simplex virus. At the beginning of July 1999, a female patient (aged 27 years) was admitted to the First Neurology Department of the University Hospital of Messina, Messina, Italy, presenting with paresthesia to the distal ends of all four limbs. This was accompanied by progressive muscle weakness up through the legs, and an inability to walk, stand up and make fine movements. Diplopia presented on the day of the admission. The neurological examination indicated a motor-sensitive polyneuropathy (particularly motorial and predominantly myelinic), which was more evident in the lower limbs and modestly involved the upper limbs. A lumbar puncture was performed and the fluid was sent to the laboratory for chemistry and microbiology analysis, with the strong suspicion of GBS. Igs with high titre of IgM directed against cytomegaloviurus and herpes simplex virus were detected, and GBS was confirmed. A course of high-dose Igs was administered, and the patient was discharged after 5 days with little improvement. By the middle of the month the patient was readmitted to the Second Neurology Department, with worsening state (deep bilateral muscle hypotone, absent osteotendoneal reflexes, deep bilateral hyposteny and fever). The clinical admission diagnosis was of seventh cranial nerve deficit, deep flaccid tetraparesis (with craniocaudal gradient), superficial and deep hypoesthesia, and growing hypopallesthesia with craniocaudal gradient. Electromyography measurements taken at the short thumb abductor, brachial biceps and anterior tibia muscles confirmed the clinical diagnosis of GBS. On day 2 after the second admission, the patient manifested respiratory muscle impairment, and hypoxaemia to the point of severe dyspnoea, requiring intubation and mechanical ventilation. The patient was then transferred to the intensive care unit, where a second fluid sample was drawn and sent to the laboratory for chemistry and microbiology analysis. A dialysis bilumen central venous catheter was inserted, a ventilator with a bilevel positive airway pressure mode was connected, and vital parameters (electrocardiogram, noninvasive blood pressure, central venous pressure, temperature) were monitored. Corticosteroids (methylprednisolone) were started at full dose (50 mg/kg per day). A course of 8 plasma exchange was performed on alternate days, but no improvement was evident. A tracheostomy was performed on the patient 1 week after the admission, to ensure airway access. On day 18 after the second admission, the condition of the patient worsened abruptly, with decreasing level of consciousness, culminating in difficult arousal and paralysis of the right arm. The ventilator mode was changed to intermittent positive-pressure ventilation and autonomic nervous system derangement was apparent, with moderate hypotension (mean arterial pressure 70 mmHg), and groin temperature remained above 38°C. A cranial computed tomography scan was performed (without contrast medium), and was normal apart from calcificated basal nuclei as a sign of old inflammatory episodes. An NMR scan (with gadolinium) was performed on day 19, and showed parenchymal hyperintensity of the left deep sylvian area, suggesting a recent acute ischaemic episode. An angio-NMR scan showed the disappearance of the left sylvian artery and its branches, as occurs with a marked stenosis (Figs 1, 2 and 3). At that moment the Glasgow Coma Scale score fell to 2+3+1. The autonomic nervous system derangement required the moderate use of vasopressors (dopamine 4 μ g/kg per h), and electroencephalography revealed a diffuse bilateral cerebral sufferance. Spinal fluid was again drawn, and further examinations showed the presence of IgG directed against cytomegalovirus and cytomegalovirus DNA, confirming that the infection was still active. An immune-modulating strategy was instituted, with a course of 5 s Igs, but this therapy had very poor effect, and the patient remained febrile (negative sputum and blood cultures, the patient receiving antibiotics). With the condition of the patient remaining unchanged (intermittent positive pressure ventilation, mean arterial pressure 90 mmHg, dopamine administration, Glascow Coma Scale score of 2+3+1, groin temperature >38°C), a new mix of Igs with high titre of IgM (Pentaglobin; Biotest GMCH, Dreieich, Germany) was employed, with impressive beneficial effects and rapid amelioration of the clinical symptoms. After a further few days the respiratory drive reappeared, allowing weaning of the patient from a controlled mode of ventilation to a continuous positive airway pressure-assisted spontaneous breathing mode, and to a simple assisted spontaneous breathing mode soon thereafter. Total weaning from the vasopressors was accomplished in 3 days, and reappearance of some twitching with intentional movements on the left side of the body occurred within 10 days. After 3 weeks the patient was capable of gross movements of both legs and the left arm, whereas the right arm remained paretic. Respiration was sufficient to close the tracheostomy and allowed the patient to breathe room air. On day 47, the patient was discharged to a rehabilitation centre. Angio-MR, assial cut: disappearance of the left sylvian artery and its branches. Angio-MR, reconstruction of the Willis polygon and disappearance of the left sylvian artery. Partitioned MR view of the disappearance of the left sylvian artery. The mechanism of neurological dysfunction in the vascular system is tissue ischaemia, which produces varied clinical effects, with transient or prolonged symptoms. Scarred vessels, as well as those that are acutely inflamed, are believed to be the main cause of ischaemia . Patients with primary isolated vasculitis of the CNS normally present with very poor signs or neurological defects, but devastating neurological abnormalities may occur depending on the extent of vessel involvement. Mononeuritis multiplex, polyneuropathy and stroke occur with more frequency, but encephalopathies, cranial neuropathies and brachial plexopathies are also seen . 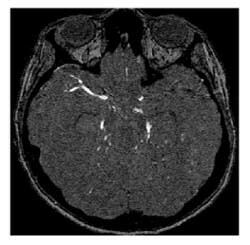 It is of primary importance to distinguish between a primary or secondary form of isolated vasculitis of the CNS and a different pathology, and radiology is the best technique to make this distinction. 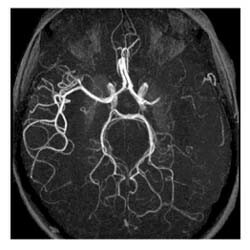 In the past, the only means whereby a diagnosis of isolated vasculitis of the CNS could be confirmed was angiography plus cerebral parenchyma biopsy . Recently, however, some investigators have proposed magnetic resonance "as the most sensitive ancillary procedure to detect CNS damage, being many of the angio-graphic features found in vasculitis non-specific" . To our knowledge, this is the first reported case of isolated vasculitis of the CNS secondary to GBS. Some important points must be emphasized in the present report. First, autoimmune antibodies were the cause of both GBS and isolated vasculitis of the CNS. Second, isolated angiitis of the sylvian left artery and its branch was secondary to GBS, and as soon as the patient recovered from the syndrome the neurological manifestations of the disease started to diminish. Third, the persistence of cytomegalovirus and antibodies directed against cytomegalovirus-DNA in the spinal fluid, despite the immune-modulating therapy, can be considered to be the trigger for both pathologies. Finally, resolution of infection with a new mixture of Igs with high titre of IgM coincided with the beginning of recovery.